Sultan Mahommed Shah, Aga Khan III, GCSI, GCMG, GCIE, GCVO, PC (November 2, 1877 – July 11, 1957) was the 48th Imam of the Shia Ismaili Muslims. He was one of the founders and the first president of the All-India Muslim League, and served as President of the League of Nations from 1937-38. He is considered to be a founding father of Pakistan. Stressing the need for a progressive interpretation of Islam, he stressed its compassion, respect for human dignity and tolerance and did much to situate his community within the Muslim mainstream. His sons and grandson have continued a tradition of service to the international community through involvement in the United Nations, through diplomacy and through initiatives funded by the Imamate. His own life bridged the colonial period and the post-colonial period in India, where he spent much of his life. He successfully led his community during both eras, helping it adapt to changing circumstances. On the one hand, he was considered to be a celebrity. Owning racing horses, he moved comfortably in the company of royalty and the wealthy. On the other hand, he was respected for his knowledge of Islam, for his philanthropy and for his commitment to human dignity. He was born in Karachi, in British India (now Pakistan), to Aga Khan II and his third wife, Nawab A'lia Shamsul-Muluk, who was a granddaughter of Fath Ali Shah of Persia (Qajar dynasty). Under the care of his mother, he received both the religious and Eastern education which his position as the spiritual leader of the Ismailis made indispensable and a sound European training. The latter had been denied to his father and his paternal grandfather. This blending of the two systems of education proved to be very appropriate, as he led his community through times of change, including the end of British rule in India and the establishment of the State of Pakistan as a Muslim homeland. He also attended Eton and Cambridge University. In 1885, at the age of seven, he succeeded his father as Imam of the Shi'a Isma'ili Muslims. As he assumed responsibility as Imam, the Aga Khan began to travel widely visiting his community across the globe. This was both so that he could receive the homage of his followers, and so that he could settle differences and advance their welfare with financial help, personal advice and guidance. The distinction of a Knight Commander of the Indian Empire was conferred on him by Queen Victoria in 1897 and he received like recognition for his public services from the German emperor, the sultan of Turkey, the shah of Persia and other potentates. In 1906, the Aga Khan was a founding member and first president of the All India Muslim League. This continued his own father's example of situating the Ismaili community within the wider Muslim community of India. Several times during his life, the community presented him with the equivalent in gold and diamonds of his weight (Golden, 1937; Diamond, 1946; and Platinum, 1954.) Almost all of this wealth was invested in programs for the welfare, education and health-care of the community. Trusts were formed after the Diamond and Platinum Jubilees which funded schools, welfare programs and hospitals. In 1934, he was made a member of the Privy Council and served as a member of the League of Nations (1934-37), becoming the President of the League of Nations in 1937. Again, he followed his father's example of public service—Aga Khan II had served on the Bombay Legislative Council. He was made a "Knight of the Indian Empire" by Queen Victoria, a Grand Commander of the Indian Empire by Edward VII (1902), and a Knight Grand Commander of the Indian Empire by George V (1912). As Imam, Aga Khan III stressed Islam's compassionate aspects and tried to re-situate the Ismaili community within the Muslim mainstream, identifying Ismaili Islam as a path or tariqah alongside others, such as Sufi orders and legal schools. He founded 200 schools throughout his community, beginning in 1905 in Zanzibar. In the same year, he re-organized the community in East Africa with a series of local and regional councils and guidelines on personal law. He initiated similar organizational structures in India. While in theory his own authority as Imam was absolute, he wanted the community to take responsibility for ordering its own affairs according to agreed ethical principles. He believed in individuals’ rights to follow the dictates of their own moral conscience. He strongly supported universal, free primary education and championed women's education. In a 1945 speech in Kenya he pledged to give one pound for every pound donated by non-Ismaili Muslims to fund education. His 72 years as Imam was the longest in history. He was an owner of thoroughbred racing horses, including a record equaling five winners of the Epsom Derby, and a total of sixteen winners of British Classic Races. He was British flat racing Champion Owner thirteen times. He married, on November 2, 1896, in Poona, India, Shahzadi Begum, his first cousin and a granddaughter of Aga Khan I. He married, in 1908 Cleope Teresa Magliano (1888-1926), a dancer with the Ballet Opera of Monte Carlo. They had two sons: Giuseppe Mahdi Khan (d. February 1911) and Ali Solomone Khan (1911-1960) Teresa, who reportedly had converted to Islam prior to the legal wedding in North Africa and was known as Princess Aga Khan, died in 1926, following an operation on December 1, 1926. He married, on December 7, 1929 (civil), in Aix-les-Bains, France, and December 13, 1929 (religious), in Bombay, India, Andrée Joséphine Carron (1898 - 1976). A former saleswoman in a candy store and a co-owner of a hat shop, she became known as Princess Andrée Aga Khan. She did not convert to Islam. By this marriage, he had one son, Prince Sadruddin Aga Khan, in 1933. The couple were divorced in 1943. He married, on October 9, 1944, in Geneva, Switzerland, Yvonne Blanche Labrousse (February 1906 – July 1, 2000). According to an interview she gave to an Egyptian journalist, her first name was Yvonne, though she is referred to as Yvette in most published references. The daughter of a tram conductor and a dressmaker, she was working as the Aga Khan's social secretary at the time of their marriage. She had been "Miss Lyon 1929" and "Miss France 1930". She converted to Islam and became known as Umm Habiba (Little Mother of the Beloved). In 1954, her husband named her "Mata Salamat." He wrote a number of books and papers two of which are of immense importance namely: India in Transition, about the pre-partition politics of India and The Memoirs of Aga Khan, his autobiography. "Ever since the time of my ancestor Ali, the first Imam, that is to say over a period of thirteen hundred years, it has always been the tradition of our family that each Imam chooses his successor at his absolute and unfettered discretion from amongst any of his descendants, whether they be sons or remote male issue and in these circumstances and in view of the fundamentally altered conditions in the world in very recent years due to the great changes which have taken place including the discoveries of atomic science, I am convinced that it is in the best interest of the Shia Muslim Ismailia Community that I should be succeeded by a young man who has been brought up and developed during recent years and in the midst of the new age and who brings a new outlook on life to his office as Imam. For these reasons, I appoint my grandson Karim, the son of my own son, Aly Salomone Khan to succeed to the title of Aga Khan and to the Imam and Pir of all Shia Ismailian followers." He is buried in Aswan, Egypt at the Mausoleum of Aga Khan. One of the most significant aspects of Aga Khan III's legacy is the tradition of international service that has continued within his family. His oldest son, Prince Aly (1911-1960), served as Pakistan's ambassador to the United Nations and a Vice-President of the United Nations General Assembly in 1957 also chairing the Peace Observation Committee. His younger son, Prince Sadruddin (1933-2003) was UN High Commissioner for Refugees between 1966 and 1978. The family of the Aga Khan has become internationally known for its commitment to peace and to human welfare, sponsoring numerous developments, aid, educational and humanitarian initiatives. ↑ Although the Aga Khans are often called "philanthropists," Aga Khan IV dislikes the term "philanthropy" because this sounds like an option, not a spiritually based obligation. ↑ "Aga Khan, Fashionable Londoner, Holds Enormous Power in Islam," The New York Times, 1923, p. XX5. ↑ Welcome to the Diamond Jubilee Anniversary of our Beloved Imam Mowlana Sultan Mohammed Shah ismaili.net. Retrieved June 10, 2008. 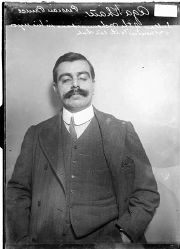 ↑ Sir Sultan Mahomed Shah, Aga Khan III. London, UK: Institute of Ismaili Studies. Retrieved June 10, 2008. ↑ "Aga Khan's Wife Dies As He Buys Big Gem," The New York Times, p. 2. ↑ "Aga Khan Marries Former Shopgirl," The New York Times, 1929, p. 3. ↑ "Aga Khan Again a Father," The New York Times, 1933, p. 9. ↑ "Princess Andrée," The New York Times, 1976, p. 19. ↑ "The Aga Khan Marries," The New York Times, 1944, p. 20. ↑ "The Begum Aga Khan III," Daily Telegraph Issue 45115, 2000. ↑ From the Will of Imam Sultan Muhammad Shah Aga Khan III ismaili.net. Retrieved June 10, 2008. Aga Khan. 1918. India in Transition: A study in political evolution. London, UK: Warner. Aga Khan. 1954. The Memoirs of Aga Khan: world enough and time. New York, NY: Simon and Schuster. History of "Aga Khan III"
This page was last modified on 7 February 2019, at 15:49.